Sanja was born in 1985 in Sarajevo, located in the former Yugoslavia . “For me, a simple question like where are you from tends to be quite complicated. Or any form that asks where you are born, it is kind of hard because the country I was born in no longer exists”. Born to a Muslim mother and a Serb Orthodox father, Sanja grew up embracing the traditions of both religions, without identifying herself as one or the other. During her early life, Bosnia was religiously and culturally mixed and interfaith marriages were neither uncommon nor contentious. In 1991, the year her sister was born, Sanja recalls the atmosphere changing; a civil war was forming, tensions were approaching her hometown, neighbours were turning against each other and religion was increasingly becoming a catalyst for division. “We stopped staying at our house and started staying at my aunts house. And then slowly we started sleeping in tracksuit pants, ready to go… We had to prepare the cellar, the basement, just in case there was anything we needed to hide. And then we started to sleep in the corridors of the house, as opposed to rooms with windows. It was a slow progression to the point that we were sleeping in the cellar. One night there were massive bombings, there was gunfire, grenades. There was my mum, dad and my sister, my aunt and her two kids, my uncle and his mother, my uncle’s cousin and their son. There were mattresses everywhere and constant gunfire. My uncle would guard the door with a machine gun. He was the last resort. Luckily nothing happened. But the house was damaged from grenades and in all of this someone came in the house and robbed us”. Knowing their lives were at risk, particularly due their interfaith marriage, Sanja’s parents decided to leave Bosnia. “The war in our area was fought by the Bosnian Muslim army and the Bosnian Serb Orthodox army. We were in a situation where neither side would protect us. Because we didn’t fit in anywhere”. Packing as many possessions possible into their little red car, Sanja, her mother, father and baby sister drove to a mountain area where her grandparents lived. Shortly after they left, a checkpoint was erected near her village. For the duration of the war, the checkpoint served to geographically and socially divide communities and families. Most of Sanja’s relatives were stuck on the other side. After staying in the mountains for several weeks, Sanja’s family joined a convoy travelling to Serbia. Sanja’s mother tracked down a previous employer who booked the family into a hotel and purchased essential items for the family. Shortly after their arrival, word spread of refugee accommodation in a nearby army barracks. However, once they toured the accommodation, Sanja’s mother expressed caution, with its military infrastructure, the barracks could be easily transformed into a prison. In the middle of the night, the family packed again into the little red car in the direction of the Czech Republic. An era without the internet or mobile phones and with limited access to landlines, intuition, word of mouth and chance meetings were integral to survival and smooth journeys. Fortunately, on their way, Sanja’s family crossed another Bosnian family who advised the Czech Republic was not accepting refugees and they should try Austria. Due to their place on the convoy a few weeks earlier, Sanja’s family had the required paperwork to cross the border and enter Austria. It was there they found the charity Caritas who were running a program matching Austrian families with newly arrived refugees. For 9 months, Sanja’s family resided with an Austrian host family. Sanja’s mother, cooked, cleaned and took care of the young children in both families and in return they paid her a salary. Although they were safe, Sanja’s parents did not have legal work rights. Strongly independent, they were adamant not to rely on government handouts or the generosity of their host family. Lacking autonomy, they were living day to day and could not envision a future. Word spread that Germany was also accepting Bosnian refugees and offering them work rights. The decision was made and the Austrian host family drove to, and farewelled Sanja’s family at the Austrian-German border. Sanja’s family settled in a refugee home in Braunlage, North Germany. Formerly a youth hostel, situated in a National Park, the home was a welcoming environment. Each family had their own room and all meals were provided. Progressively more Bosnian families joined. The children went to school, and all the residents enjoyed freedom of movement. A year later, Sanjas’s family moved into their own apartment in the nearby city of Braunschweig, found work and were living a self-supported, comfortable life. However, their future was still uncertain. Germany had allowed Bosnian refugees into the country under the provision they would return once the war was officially declared over. Although the war was nearing the end, Sanja’s parents knew returning to Bosnia was not an option. The country had been segregated along religious lines. Bosnia was a different place to what they had known and they would not be safe. “Even though the war ended in 1995, and there was a ceasefire, there was still a lot of anger, division and sadness. Because of my parents mixed background there was nowhere for us to go. The country had been divided”. On the 19th February, 1998, after a lengthy process that took three years and an initial unexplained Visa rejection, Sanja’s family arrived in Australia. With a suitcase, a backpack and duffel each, Sanja and her family arrived as permanent residents, after spending 7 years, half of Sanja’s life at the time, living an uncertain future with the impending threat they may have to return to a divided country. For the first time, in nearly 7 years, they felt secure, not only did they have a future, they could also make plans and establish roots. However, parallel to her comfortable life in Australia, an enduring curiosity and fondness of Bosnia manifested in the space between. Leaving at a young age, questions of identity and belonging persisted for Sanja; materialising in many return trips to Bosnia to explore her relationship with her birth country. “There is always this feeling that you are leading a life that you weren’t mean to lead. We had our life set out for us, we had everything planned. And then the war happened and we got thrown off our axis and we are just leading this life. And there is always that feeling that you don’t belong there because you were born there, you should have been there, this is your life etc. So I always had that, and carried that with me. After a long trip to Bosnia, I realised that I don’t see myself living in Bosnia anymore. And that is what it took, for me to go over there. And I realised that I was a different person, and I was used to certain things that I learnt throughout my life, particularly in Australia”. Ninetineen years after first arriving in Australia, Sanja now lives in Hong Kong. 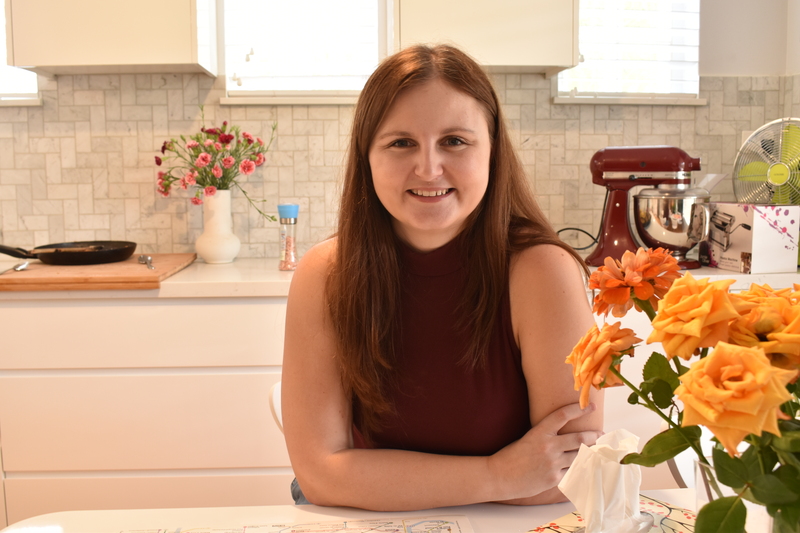 Living in a third country, Sanja uses trips home to indulge both her Bosnian and Australian heritage through her collection and movement of food items. Sanja’s suitcase bound for Hong Kong includes Bosnian pate, German Chocolate and Australian biscuits, culinary tributes to her travels, her story, her journey. “You can’t recreate the people, you can’t recreate the place but you can recreate the food”. “This is Bosnian halva, my mother’s and my father’s family used to make it when they had rations. It is something they used to make in WW1 and WW2. Now it is perfect for those occasions when people came over at the last minute”. Once the flour mixture is completely dry and oil is absorbed, pour the sugar syrup over the flour mixture. This is the second post in a special series dedicated to my collaboration with Settlement Services International in the lead up to their annual New Beginnings: Refugee Arts & Culture Festival during Refugee Week 2017. A big, warm thank you to the SSI staff and volunteers who have assisted in the project collaboration so far.